On Thursday, November 8, 2018 at approximately 5:51 PM, The Shiloh Police Department responded to Walgreens located at 1108 Hartman Lane for an attempted aggravated robbery in progress. The suspect passed a note to the clerk through the pharmacy drive thru window demanding specific prescription medication. In the note, the suspect referred to himself as “T Grizzly.” The note inferred there were additional suspects involved and threatened force if the clerk did not comply. The suspect left the drive thru before receiving anything from the pharmacy. No one was harmed during this incident. The suspect was described as a black male between twenty and thirty years of age wearing a Ninja Turtles mask. He was driving a late 1990’s or early 2000’s model Kia sedan. The vehicle was described to be silver or gold in color. 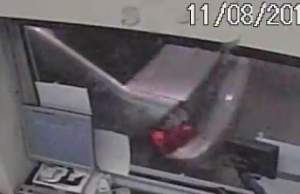 There is no surveillance video of the suspect and the best surveillance photo of the vehicle has been included. Anyone with information regarding this case is encouraged to contact the Shiloh Police Department.